Range: Entire Europe and South Russia. Habitat: Dry warm edges of coniferous and mixed forests at almost all altitudes. "When a male intercepts a female the pair quickly settle on the ground, either among grasses or on rocks or fallen branches. The male lands behind the female, and then walks around her until they are facing each other. 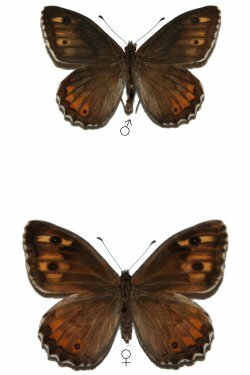 If the female has already been mated she signals her unwillingness to copulate by fluttering her wings. 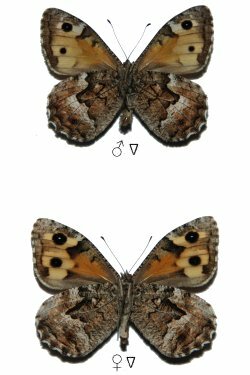 On the other hand if she is a virgin she remains stationary and the male flicks his forewings upwards to display the ocellus at the apex. A moment later he begins his full display, flicking his wings open and shut several times in rapid succession. He then fully opens his rapidly vibrating wings while leaning forward, as if bowing to the female. 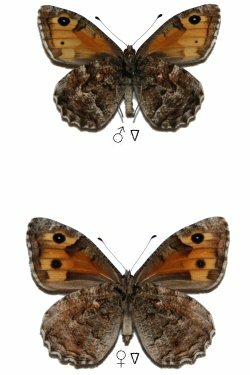 Next he slowly closes his wings, trapping the female's antennae between them, and "combing" them with his forewings so that her antennae are rubbed against the androconia on the upperside of his forewings. This effectively seduces the female. The male then quickly walks around her until he is alongside, but slightly behind her, allowing him to curve his abdomen forward to make sexual contact. 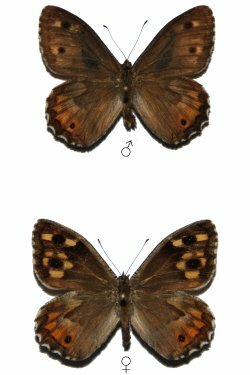 Once copulated he then straightens up so the pair face away from each other."